Le Café Politique De Camus De Café: The Elites Are In Trouble (Finally)! Plus Defusing DC Protestors. The Elites Are In Trouble (Finally)! Plus Defusing DC Protestors. Chris Hedges, Truthdig: "Ketchup, a petite 22-year-old from Chicago with wavy red hair and glasses with bright red frames, arrived in Zuccotti Park in New York on Sept. 17. She had a tent, a rolling suitcase, 40 dollars' worth of food, the graphic version of Howard Zinn's 'A People's History of the United States' and a sleeping bag. She had no return ticket, no idea what she was undertaking, and no acquaintances among the stragglers who joined her that afternoon to begin the Wall Street occupation. She decided to go to New York after reading the Canadian magazine Adbusters, which called for the occupation, although she noted that when she got to the park Adbusters had no discernable presence." The lords of finance in the looming towers surrounding the park, who toy with money and lives, who make the political class, the press and the judiciary jump at their demands, who destroy the ecosystem for profit and drain the U.S. Treasury to gamble and speculate, took little notice of Ketchup or any of the other scruffy activists on the street below them. The elites consider everyone outside their sphere marginal or invisible. And what significance could an artist who paid her bills by working as a waitress have for the powerful? What could she and the others in Zuccotti Park do to them? What threat can the weak pose to the strong? Those who worship money believe their buckets of cash, like the $4.6 million JPMorgan Chase gave a few days ago to the New York City Police Foundation, can buy them perpetual power and security. Masters all, kneeling before the idols of the marketplace, blinded by their self-importance, impervious to human suffering, bloated from unchecked greed and privilege, they were about to be taught a lesson in the folly of hubris. The occupation of Wall Street has formed an alternative community that defies the profit-driven hierarchical structures of corporate capitalism. If the police shut down the encampment in New York tonight, the power elite will still lose, for this vision and structure have been imprinted into the thousands of people who have passed through park, renamed Liberty Plaza by the protesters. The greatest gift the occupation has given us is a blueprint for how to fight back. And this blueprint is being transferred to cities and parks across the country. “It’s funny that the cops won’t let us use megaphones, because it’s to make our lives harder, but we actually end up making a much louder sound [with the “people’s mic”] and I imagine it’s much more annoying to the people around us,” she said. “I had been in the back, unable to hear. I walked to different parts of the circle. I saw this man talking in short phrases and people were repeating them. I don’t know whose idea it was, but that started on the first night. The first general assembly was a little chaotic because people had no idea … a general assembly, what is this for? At first it was kind of grandstanding about what were our demands. Ending corporate personhood is one that has come up again and again as a favorite and. … What ended up happening was, they said, OK, we’re going to break into work groups. The work groups make logistical decisions, and the general assembly makes large policy decisions. Working groups blossomed in the following days. The media working group was joined by a welcome working group for new arrivals, a sanitation working group (some members of which go around the park on skateboards as they carry brooms), a legal working group with lawyers, an events working group, an education working group, medics, a facilitation working group (which trains new facilitators for the general assembly meetings), a public relations working group, and an outreach working group for like-minded communities as well as the general public. There is an Internet working group and an open source technology working group. The nearby McDonald’s is the principal bathroom for the park after Burger King banned protesters from its facilities. Caucuses also grew up in the encampment, including a “Speak Easy caucus.” “That’s a caucus I started,” Ketchup said. “It is for a broad spectrum of individuals from female-bodied people who identify as women to male-bodied people who are not traditionally masculine. That’s called the ‘Speak Easy’ caucus. I was just talking to a woman named Sharon who’s interested in starting a caucus for people of color. While someone is speaking, their words amplified by the people’s mic, the crowd responds through hand signals. But perhaps the most important rule adopted by the protesters is nonviolence and nonaggression against the police, no matter how brutal the police become. I tell Ketchup I will bring her my winter sleeping bag. It is getting cold. She will need it. I leave her in a light drizzle and walk down Broadway. I pass the barricades, uniformed officers on motorcycles, the rows of paddy wagons and lines of patrol cars that block the streets into the financial district and surround the park. These bankers, I think, have no idea what they are up against. 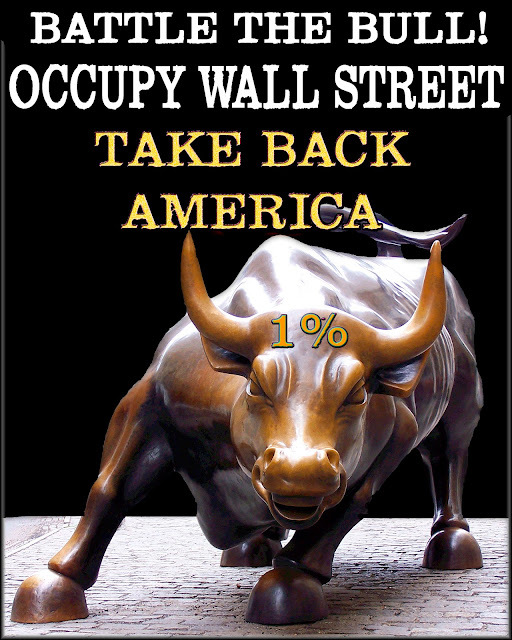 Occupy Wall Street! #occupywallst www.occupywallst.org www.nycga.net. Occupy Wall Street's 'Human Microphone': Insanely Brilliant...Or Just Insane? 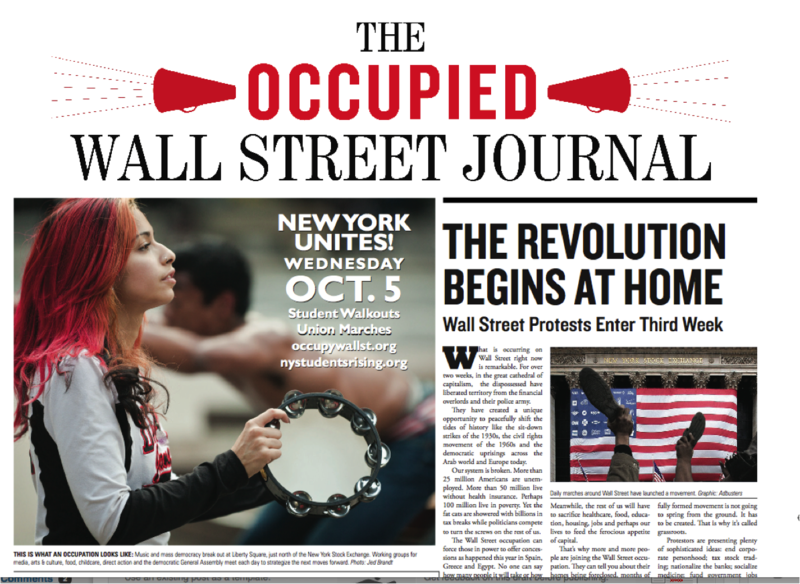 Occupy Wall Street Protests: Where Does the Coalition Stand as Week 4 Begins? ESPN, Occupy Wall Street, and Hank Williams Jr.
Progressive magazine editor says young worker unemployment at "60-year high"
Video Feature: Wallace Shawn, renowned actor, author, playwright and thinker, tells Laura Flanders why he cares about Occupy Wall St: "I don't know about other people but I only have one life, and I don't want to live it in a sewer of injustice." 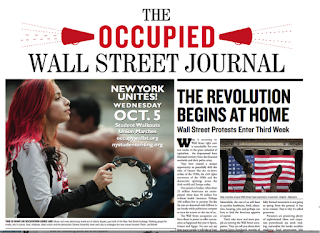 Special Coverage: As we enter Day 23 of the Wall Street Occupation the movement begin to pick up steam across the country. Thousands of activists have descended on Wall Street since this past weekend as part of the #OccupyWallStreet protest organized by several action groups. What follows is a live video stream and live Twitter feed of this event. Contrary To What One Might Think; This Is Not A Good Move, But A move To Marginalize The DC Efforts And Reduce Them To There Usually Non-Confrontational Political Theater. WASHINGTON (AP) Anti-war and anti-corporate greed protesters have accepted an offer by U.S. Park Police in the nation's capital to extend by four months their permit to demonstrate. The protesters have spent the past four days camping in the Washington's Freedom Plaza near the White House. October 2011/Stop the Machine has scheduled other marches and rally's throughout the week. Its permit had been set to expire on Monday and organizers said they had planned to stay put anyway.